Remember the G Watch R from LG? The one that looks like a souped up G Shock? Well, the company sort of announced global availability this morning, which will begin overseas in early November, followed by North America and other territories shortly after. Many folks have been waiting to get their hands on the G Watch R after LG announced the device, right around the time the Moto 360 went on sale from Motorola. LG’s claim to fame for the G Watch R is that it features a full circle display, unlike the Moto 360, which features a small black bar on the bottom of the display to fit in an ambient light sensor. Besides its full circle display, the G Watch R features a Snapdragon 400 processor, 4GB of storage, 512MB of RAM, 410mAh battery, various sensors, and is water and dust resistant. SEOUL, Oct. 24, 2014 ― LG Electronics (LG) announced today that its newest Android wearable, LG G Watch R, will be available for purchase at retail sites throughout Europe including countries such as France, Italy, Spain and the UK in the beginning of November, followed by key markets in North America, Asia and the Commonwealth of Independent States (CIS) soon after. Customers in select markets will also be able to purchase G Watch R on Google Play in the weeks ahead. The LG G Watch R made its world debut at IFA 2014 to much interest and with its stylish looks and smooth, speedy performance, became one of the show’s most mentioned new products. The world’s first watch-style wearable to feature a fully circular Plastic OLED (P-OLED) display, the G Watch R was inspired by classical and premium timepieces. The 1.3-inch circular P-OLED display takes advantage of every pixel, producing images with stunning color and accurate viewing at all angles even under bright sunlight. Designed and built to last, the LG G Watch R features a classic design encased in durable stainless steel and aluminum powered by a 410mAh battery, the largest in an Android Wearable to date. Like the original LG G Watch, the G Watch R delivers optimal performance through its powerful but efficient 1.2GHz Qualcomm Snapdragon™ 400 processor with 4GB of storage and 512MB of RAM. With an Ingress Protection rating of IP67, the device is completely protected from dust and water resistant for up to 30 minutes at a maximum depth of one meter. The G Watch R, designed with personalization in mind, is compatible with any 22mm wide watch strap. 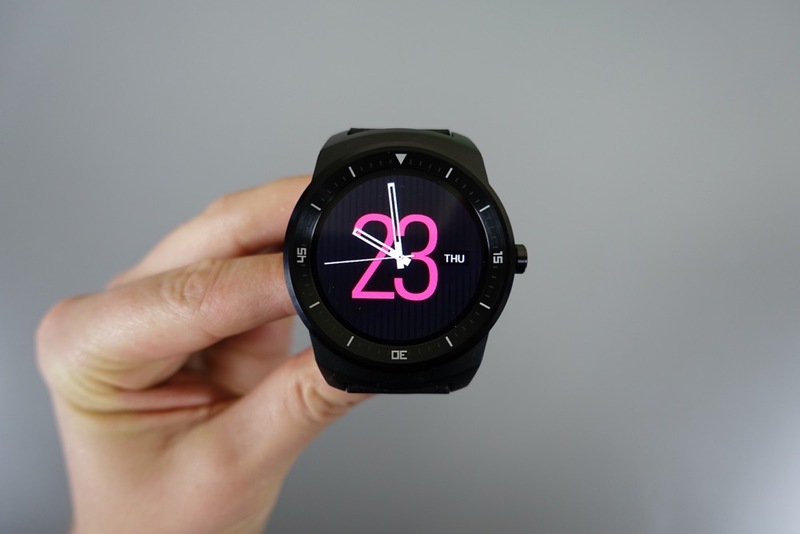 The LG G Watch R offers six new pre-loaded watch faces and improved power savings in ambient mode. The update to Android WearTM OS will add even more features and functionality to G Watch R such as offline music playback. Updates will be performed seamlessly through the smartphone with the owner’s permission. Prices and additional purchase details will be announced locally at time of availability. For more product images and videos, please visit www.lg.com/global/gwatch/r.